For the past several months I’ve been experimenting with various location-based services (LBS). 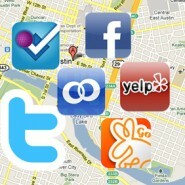 Foursquare, Gowalla, and Yelp have been the main ones I’ve been using. I realize there are others such as Facebook Places, Loopt, Brightkite, etc., but I had to start somewhere to see what all the fuss was about. I have a couple of initial thoughts on each of the services and then I’ll get into where I hope location-based services will evolve. For the record, when location-based apps first launched I saw it as nothing more than a stalker’s dream come true. As I read more about how these programs were developed, it started to make more sense to me and I could see other possibilities. The social-networking element of these programs is really their strength. While trying to meet up with your peers at a conference, having a service where you can check-in and see where everyone is currently located is valuable. Keeping it limited to people you know is the key to reducing the “stalker risk.” Businesses got into the mix because they saw a way to see who was in their store and could target a marketing message to them. Probably the most refined out of the three I’ve tried. It’s easy to add new locations and already has a very extensive list of businesses and locations to check-in. It’s strength is in its popularity so it has the most businesses that offer specials. Rarely have I been in an area that had less than 6 specials indicated nearby. Unfortunately, most of the check-in specials are little more than a digital punch card…”check-in the business ten times and receive ‘x’ for free.” Granted, I’m less likely to lose my punch card before I can get my free sub, but if it was really that big of a motivator I wouldn’t lose the card in the first place. I’ve been using this for about a month and I have yet to see any actual offers or incentive to continue using it. Most businesses in the area are listed multiple times (the gas station I usually go to is listed 3 times) so I’m never sure which one I should be using. Also, I keep getting random digital items like blocks, bats, various fruits and vegetables. I have no idea how these items are supposed to be used. I suppose I could look in a FAQ or something, but really if it requires that much work to understand it, I don’t think I’ll see the value. Of the three I’ve tried, this has definitely been the least useful. I first started using Yelp on a vacation to San Diego. My wife and I were looking for local restaurants and activities and Yelp has the most extensive customer reviews. We found some great local establishments that we otherwise would not have found/tried. For the day-to-day tasks, this isn’t as helpful but when looking for something new to do it’s really been a valuable resource. Location-based services should/could be so much more than digital punch cards and user reviews. Most mobile marketing “experts” say you should have a specific promotion that isn’t available in your other channels. To a certain extent I agree, why should I use Foursquare if I can get the same offer in the email you send? Where I disagree is that this approach has nothing to do with the fact this is a location-based offer. What can you provide knowing that a customer or potential customer is down the street? Here is a random sample of potential enhancements companies could make using location-based services. Register that you have an appointment using the location-based service. Once you arrive in the area, if it matches the appointment time you get an alert that asks if you’d like to check-in for your appointment. By the time you’re in the waiting room, the nurse is ready to take you back to the exam room. Have your insurance information and co-pay taken care of electronically and you’re good to go. This is where Facebook Places could really shine. When someone “likes” your product/company page on Facebook, it automatically tags the item to give you an alert when you are close to a location that has the product on sale. For example, say you Like the page for Pixar and you are close to an AMC Theatre which is showing Cars 2. If the showtimes are within a preset window (say 20 minutes) you get an alert that links you to the site to buy discounted tickets. Or let’s say you Like the page for Dr. Pepper. When you are near the grocery store, you get an alert that says 12-packs are on sale. Of course you don’t want to be bombarded by location alerts, but those could be adjusted in the settings to customize either the products, the amount of the discount, etc. I have to be careful here. My wife has an idea that she swears is a money-maker and doesn’t want me to share it in the blog. However, I will share a small portion. In a location-based program like Yelp when you’re looking through reviews trying to decide what restaurant to dine, have it link to the current wait time. There have been numerous times we went to a restaurant only to find the wait time was longer than our stomachs could handle so we had to move on to an alternate choice. As an additional feature, if I’m down the street let me add my name to the wait list and let me check-in when I arrive. We recently went to Disney World and Universal Theme parks and there were numerous opportunities for location-based services. Give me a special map of the park that tells me which characters are currently close to my location so my kids can have a photo-op. Going back to the wait times above, let me know which rides have the shortest wait times so I can maximize my visit. Is it hot that day? Highlight which locations in the park have water or ice cream available (I say this because on our vacation to Universal Studios, even though every treat stand we went to had a picture of an M&M Ice Cream bar, none of them had one available which meant three disappointed kids). Put some GPS trackers on the monorail and shuttle buses so we can see exactly when the next shuttle will arrive. Although I enjoy the “anticipation” of when a bus will arrive, when you’re hot and tired…the thrill is gone. Or if you prefer, let me indicate where I want to go – if enough people in the area are going to the same place, re-route a shuttle to improve efficiency. Ok, so broadcasting wait times for the women’s restroom may be overkill for the wait time idea. But, what about ordering food? Show me which vendors are walking close by or better yet, let me order my food through the app and have it delivered to my seat. The new Livestrong Park in Kansas City is working toward something similar. Each seat has a QR code that the person can scan to “check in” to the game. Unfortunately, right now that’s all you can do is check into the game. The code doesn’t provide any special benefits or any real reasons to scan it right now. I take my kids to Great Clips for their haircuts. When a new customer walks in, one of the stylists has to stop the haircut they’re working on to collect the customer information and add them to the queue. Have the check-in from a location-based service automatically add them into the queue. The stylists get to continue their work uninterrupted. Ultimately, if location-based services want to move past the early adopters and be utilized by mass consumers, companies will need to expand beyond the basic “check in.” Providing badges and mayorships will only engage customers for so long. The benefits of utilizing location services must outweigh the privacy concerns and other barriers to mass consumer adoption.